On May 12th, thousands of people all over the world will take to the streets and reoccupy the public squares to continue what began in 2011. They will protest against an unjust and undemocratic economic and political system. They will raise their voice for radical global change. They will begin to again shape their own future. Occupy Erlangen // Echte Demokratie jetzt! Erlangen [Real Democracy Now!] joins the worldwide movement with an open assembly in the central square of Erlangen. 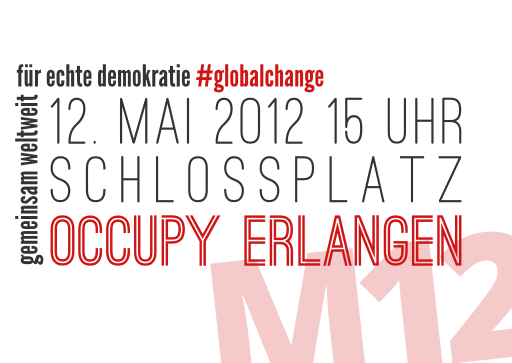 This entry was posted in en, Occupy Erlangen on May 11, 2012 by Noya.